In honor of National Benefits Department Day, Fermilab's Benefits Department will offer free donuts and coffee all day on WH 15 West. Stop by to enter a drawing for a free vacation day. Where there�s smoke�.On a day with no IT mishaps, Computing Division staff took a break from solving system failures to burn Service Desk tickets. Chief Information Officer Vicky White announced yesterday that the Fermilab Computing Division had completed an entire day with no major power outages, server failures, breaker trips or other labwide malfunctions in IT services. With no emergencies to handle, CD personnel turned to the backlog of Service Desk tickets. Fermilab physicists held a car wash Wednesday, March 25, to raise money for the proposed Deep Underground Science and Engineering Laboratory in South Dakota. Jim Strait, head of the Long Baseline Neutrino Experiment, which would send beams of neutrinos from Fermilab to the underground lab, said the project is key to the laboratory's future but will require substantial resources to construct. 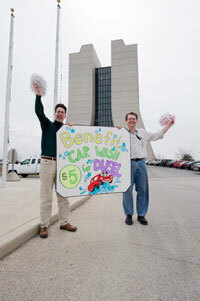 Strait praised the enthusiasm of car wash leaders Kevin McFarland and Mike Lindgren, pictured above. The LBNE group plans a bake sale and raffle later this year. The news is historic, or rather "prehistoric" to be more precise! It has taken two physicists studying the collisions at 7 TeV in the centre of mass on 30 March only two days to make an astonishing discovery. From their precise analysis of four events, Alain Grand and Ricarda Owen have found evidence of a new, massive neutral particle thought to have existed in the very early Universe. "It's awful", explains Alain Grand, still shocked by the discovery. "It left horrible tracks inside the detector that made the physicists on duty at the time feel quite sick". No wonder. The particle consists of two strange quarks and one top quark but no beauty or charm quark. The physicists have nicknamed it the "neutrinosaurus" because of its repulsive appearance and prehistoric origins. 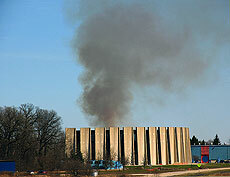 Hints of the new particle had already been glimpsed in two events at Fermilab but the statistics were too low to be published. The four events observed at the LHC generated an exponential increase (22=4) in the statistics, allowing the physicists to announce the discovery unequivocally. The discovery of the particle, which had hitherto been postulated only by an impassioned physicist doing a bit of theory in his spare time, has the potential to turn current theory on its head and to send the entire theory community back to the drawing board. "One important consequence is that all the particles we know today must have had a prehistoric twin", says Ricarda Owen. There will have been a protonosaurus ancestor for the proton (not to be confused with the many-protoned brontosaurus), the electron will have descended from the electronosaurus, and so on. It remains to be seen whether these paleoparticles had antimatter doubles, such as antineutrinosauruses and other antiparticulosauruses. "That's what we're going to be concentrating our efforts on finding now", says Alain Grand. "If they existed, we expect them to be the exact opposite of the paleoparticles we've found so far, in other words extremely elegant". Whatever happens, the discovery has opened up paleoparticle physics as a unique and exciting new field of research! 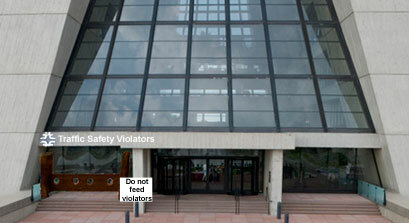 Wilson Hall's new stocks will promote traffic safety. 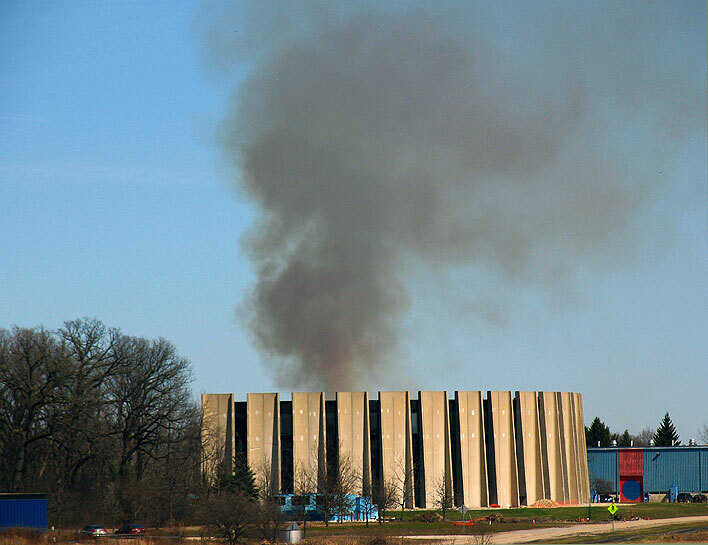 Funds for infrastructure improvement from American Recovery and Reinvestment Act will help support enhanced traffic safety at Fermilab�and put local contractors to work at the same time. Fermilab officials announced that they have awarded the contract for construction of a set of stocks to be built outside Wilson Hall�s front entrance. Employees or users who receive three citations for traffic safety violations within a six-month period, or three parking violation notices in three months, will spend up to several hours in the stocks. The use of cell phones, including hands-free devices, while driving will also result in time in the new device, explained ES&H Head Nancy Grossman. Laboratory officials considered various alternatives before settling on the stocks option. They rejected an initial proposal to use boiling oil amid concerns about U.S. dependence on foreign oil and increasing awareness of the effect of carbon emissions on climate change. �In the end, even though it cost slightly more, we went with an environmentally friendly solution,� said Chief Operating Officer Bruce Chrisman. The stocks construction project, awarded to Ethelred and Sons, a local company specializing in stocks, thumbscrews and gallows work, is estimated to take about six weeks and create 4.7 new jobs. The stocks will hold up to four offenders at one time, with the possibility for a future upgrade to five. ES&H Head Grossman said she fully expects that employees will follow the new traffic safety edicts and hopes the laboratory will never have to use the stocks. In an effort to save money and reduce the number of nuisance birds on site, the cafeteria staff has begun culling the goose population. The Fermilab cafeteria will also begin using local vegetation in its menu as an effort to serve only locally produced food. Carn Ivore, cafeteria manager, said eating items produced and captured on Fermilab lands will reduce shipping and preservation costs, plus increase the freshness of cafeteria cuisine. Emoticons and exclamation points!!!!! - How to show your excitement!!!!!!! !